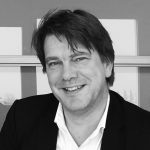 Patrick Fransen (1967; graduated with honors TU Eindhoven) has extensive experience in managing large teams of architects and experts. Surrounded by a young international team of designers and experienced technical experts, he is the principal architect and supervisor of complex projects and small ‘gems’. This experience resulted in a networking-oriented attitude and the need for in-depth research into this way of working. Through creating NOAHH, he was able to explore this way of working more thoroughly. Patrick Fransen is also a frequent visiting professor at Dutch and international universities, as well as a jury member in architecture competitions.